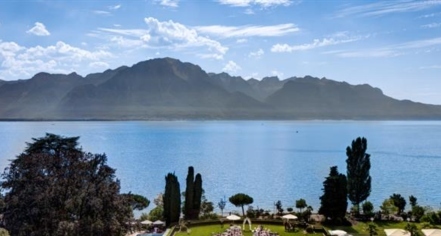 Montreux is one of the most beautiful places in the world and Fairmont Le Montreux Palace is close to the best the region has to offer. Between the skiing, sightseeing, chocolate tasting, wine drinking, and jazz, there is world class shopping, fine dining, and museum exhibits to partake in. The concierge at the hotel knows the options can be overwhelming and have taken it upon themselves to create a series of itineraries for guests. Taste the spectacular Swiss wines at this UNESCO World Heritage Site. Sitting right on Lake Geneva, there is evidence that wine has been grown here since Roman times, with the current vineyards dating to the 11th century monasteries on the site. The Christmas Market comes to Montreux every year with merchants displaying their wares and a visit with Santa for the kids. With decorations, arts and crafts, regional culinary delights, mulled wine, and an endless array of artisans, the Christmas Market is not to be missed. The former estate of Charlie Chaplin’s family has been preserved as a museum for a look at his life of achievement. With exhibits, a Hollywood-style studio, and plenty of history, film-lovers and everyone else will find this museum endlessly fascinating.